Forever New® Fabric Care Wash is a pure, organic, HE (High Efficiency) wash formulated to gently clean, brighten and promote longer life for all fine washables. Using a natural base of multiple sodas and citrus that lift stains and soils, our special formulation is highly effective and uniquely formulated for all types of washable fabrics. 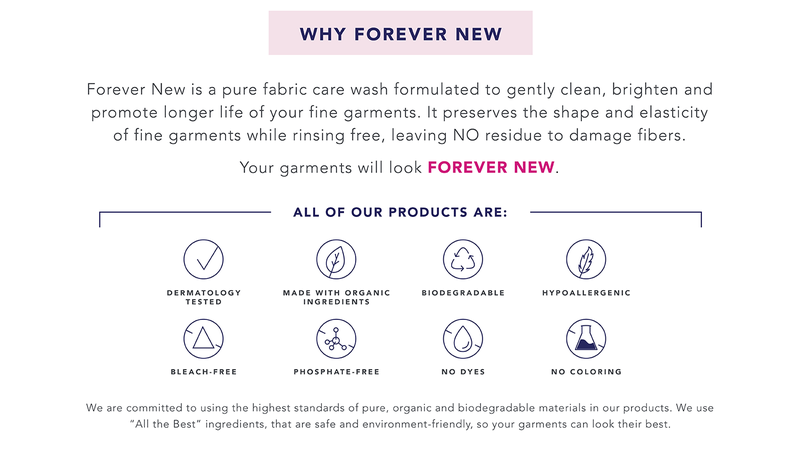 Forever New products contain no bleach, optical brighteners, lanolin or petroleum products. With a mild, fresh laundered scent, Forever New maintains elasticity and keeps colors vibrant, allowing all fine garments to look and feel new longer. Variance is specially designed for medical and compression garments, such as support hosiery, shapewear, binders, lymphedema sleeves and mastectomy garments. Hypoallergenic and unscented, Variance is advanced cleaning that preserves fibers with flex memory such as Spandex and Lycra blends. Variance thoroughly cleans fibers of their daily accumulation of perspiration and body oils where a special surfactant ensures a quick breakdown of these accumulations. The natural citrus and sodas lifts tough stains and removes residues left behind by other detergents that can often trap oils and odors. Variance wash protects elasticity and shape, leaving garments looking and feeling new longer. Forever New Baby is a doctor-recommended, all-natural, hypoallergenic fabric care wash designed to gently clean, brighten and promote longer life for your toddler’s washables. Specially formulated as a High Efficiency (HE) wash, Baby preserves the softness and comfort of delicate baby wear, sleepwear, swimsuits, blankets, stuffed toys, and more. The patented odor eliminator removes tough odors from cloth diapers, bibs and burp cloths, leaving only the natural freshness of unscented or a Clean Cotton scent. A detergent with a patented odor eliminator specifically formulated to fit active lifestyles, STRETCH Athleisure wash is uniquely designed to keep active wear smelling fresh while removing workout funk and maintaining the elasticity of the garment. Stretch rinses completely out, while removing soils, perspiration, body oils, and chlorine from clothing. Gentle enough for all fabrics, but IDEAL for swimwear and sportswear. Stretch is an organic, HE-wash, using all-natural ingredients, special citrus and sodas to lift stains and soils while keeping colors vibrant, and maintaining shape, fit and form of active wear, swimwear, and compression sportswear. A patented odor eliminator kills bacteria causing odors at the deeper level, removing residues that trap odors and break down fibers in stretch fabrics. Available in granular, liquid, and a pre-treatment freshening spray. Forever New Stain Remedy 4oz. Forever New Granular Original Scent Detergent 32oz. 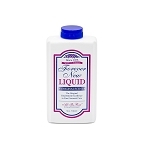 Forever New Original Scent Liquid Detergent 32oz. Forever New Baby Liquid Clean Cotton Detergent 32oz. Forever New Baby Liquid Unscented Detergent 32oz.